With the 2014 Bryce Smith and Associates Ltd Whanganui Arts Review now open, last year’s winner Prakash Patel was generous enough to talk to us about his work and experiences with the Arts Review. 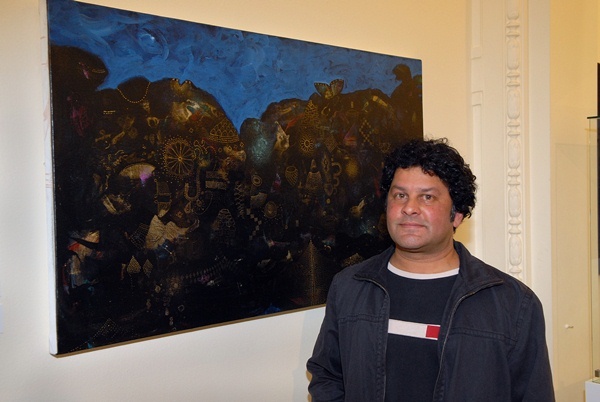 Prakash has entered the Review every year since his return to Whanganui in 1995 and he has won the Open Award, the top prize, four times. How would you characterise/describe your paintings? I work in an intuitive way – my paintings rather than being recognisable as landscapes for example, or figurative in nature, are less easily defined. There is also a cultural influence in the work which comes from my upbringing. I find fundamental aspects of Indian philosophy resonate strongly within my work particularly in the way it adheres to a holistic view and that everything is connected from the microscopic world to the cosmos. For me each painting is an adventure of exploration, experimentation and discovery. I enjoy being lost in my work with all its chaos and mess and through it all I occasionally I find my way. What has winning the arts Review meant to you? Of course, winning first prize was, especially that first time, a huge boost to my confidence and encouraged me to keep going with my painting. I have to say that I have never entered the Review with the aim of winning it; I like to enter a piece that is representative of my recent work. Another wonderful benefit from having won the Review is that on two occasions the Sarjeant purchased my work for their Collection. This is of particular significance for me. My parents emigrated from India and established a green grocer shop in Castlecliff. Somehow my being able to have my work included as part of the Gallery’s permanent Collection has afforded me a sense of belonging and permanence. Also, at that time, I only knew of one other Indian artist in New Zealand. What do you think makes the Whanganui Arts Review so unique? Why do you think it is important? The Review is a celebration of the rich diversity of the creative community in Whanganui. It is an opportunity for people to show each other and the public what they’ve been up to. Because it is a recurring event, it functions as a focal point in the year for local artists to showcase their work. It is great that the Sarjeant Gallery supports local artists in this way; it is a good thing for an artist to be able to show their work in a beautiful, professional space in a public art gallery, this applies particularly to recent graduates. With the Sarjeant Gallery Queen’s Park is closed, how do you feel about the Arts Review moving to Sarjeant on the Quay? Change is good. Now that the Sarjeant on the Quay is part of the hub of activities and businesses down by the river; it is going to be interesting to see if a different crowd of people drop by to visit the Review. New audiences can only be a positive thing. For me personally I am looking forward to seeing everyone’s work exhibited in the new space.